St David’s Day this week and though it may not be showing in the skies above us quite yet, the official start of spring means there’s no better way to toast Wales’ patron saint than with a glass, or a few, of Welsh beer. Traditional breweries abound, of course, but Wales is noisily playing its own part in the craft beer renaissance, staking its claim on the demand for flavour-packed, inventive and exciting brews. Here’s Rob Eveleigh of craft beer bottle shop Beer Revolution’s guide to the new wave of Welsh breweries putting the nation on the craft beer map. Iechyd da! What started out as a two-man band operating from a B&Q garden shed is now a 2000 litre-a-week brewery employing nine people, but the next step in Crafty Devil’s journey will take more than the incendiary ambition of founders Rhys Watkins and Adam Edinborough. Currently they’re sending all their beer to contract canners for packaging, but they have a long term goal to get their music-inspired brews to their adoring fans quicker and fresher by installing their own canning line. In the meantime, they’ve expanded production and moved premises to a shiny new brewing facility. Small scale brewing is a license to experiment and as Wales’ tiniest outfit, Seren has that freedom in spades. Operating from a converted scullery deep in the Preseli hills of Pembrokeshire, brewer Ali Kocho-Williams has reaped accolades for his legendary Bluestone IPA, but the slow-beating heart of Seren is its sour beer and barrel aging programme. Ali cultures his own house strains of beer-souring critters, resulting in wild ales with unusual depth and earthy complexity. In June, Seren will be representing Wales at Italy’s Arrogant Sour Festival and Ali plans to build on his success in barrel aging by releasing a sour brown ale aged in the UK’s only maple barrel. 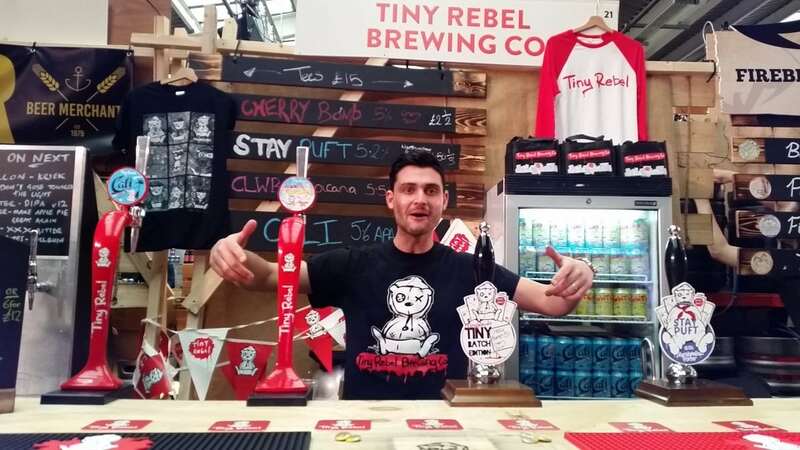 Tiny Rebel’s roughed-up bear comes of age this month, cementing five whirlwind years of success with a £2.6m expansion to a brand new brewery and event space with the capacity to produce 5 million litres of beer a year. They’ve already christened the new facility with the release of their first canned beers, but despite the innovation and investment in new packaging technologies they plan to keep a foot in the old school: while other craft breweries have called time on the production of cask beer, Tiny Rebel have pledged their allegiance to traditional dispense by expanding their cask range. In a scene largely dominated by US-inspired, hop-forward pale ales and IPAs, Geipel stands out as a beacon of European brewing tradition, drawing on German lagers and hefeweizen for influence. Ohio-born founder Erik Geupel is on a mission to rescue lager’s reputation from the bland offerings of the big-beer, macro breweries, and his hazy, unfiltered and unpasteurised brews are a lesson in just how flavoursome this style can be given the right care, ingredients and artisanship. Fully recovered from the bruising demise of Celt Experience, former head honcho Tom Newman is back with a new project focusing on high-end, experimental brews with a strong Belgian influence and aimed at the most discerning beer connoisseur. Caerphilly-based Lines has had an impressive start, bagging best new Welsh brewery and best Welsh beer for their imperial stout at the annual Ratebeer awards in the States. James Beavan and Rob Faulkner have spent most of their working lives in the bar and pub trade, and set up Tenby Brewing Co in 2015 after buying the defunct Preseli Brewery. Just two years on and they’re already upping their game and their capacity, having just taken delivery of Tiny Rebel’s old brewing kit. Their eclectic canned releases run the full gamut of genre-bending style – from maple breakfast stout to gooseberry-laced American pale ale. To experience Tenby’s beers at their freshest, head to their street food and brew joint, The Sand Bar, on the town’s South Parade.